KwaZulu-Natal Country Hotels in South Africa boast breathtaking scenery, lush vegetation, beautiful beaches and tranquil nature. This is also the home of the mighty Zulu nation, great African wildlife experiences and of course the majestic Drakensberg Mountains. This is the land of relaxation where you can escape the hustle and bustle of the city. KwaZulu-Natal provides a wonderful range of luxury country estate accommodation. Stay at cosy retreats in lush surroundings, whether it's near a beach, in the Drakensberg Mountains or in close proximity to Durban. All country estates boast excellent service. Enjoy complete privacy, luxury accommodation and breathtaking views at one of KwaZulu-Natal's magnificent country lodges. These country estates are a perfect KwaZulu-Natal wedding venue, special event or private function. Enjoy beautifully decorated lush gardens, friendly staff and excellent service. Guests can relax in tranquil surroundings and enjoy the stunning scenery. A wedding ceremony at one of the KwaZulu-Natal country estates in South Africa will be truly romantic. Play a round of golf on championship golf courses at KwaZulu-Natal country estates. Some greens are right on the Indian Ocean. Enjoy the great sea views and sports at the same time. After the game, you can relax and tan at the beaches of the Elephant Coast or Dolphin Coast. 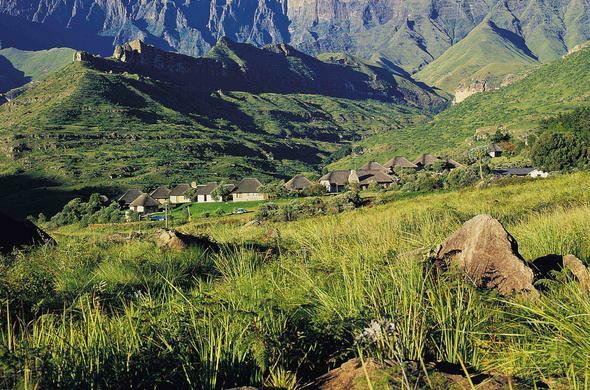 KwaZulu-Natal is home to the magnificent Drakensberg Mountain massif. Hike to the top, enjoy stunning views of the Amphitheatre or take a picture of the Tugela Falls. For those who are interested in history, this region of South Africa has a lot to offer. Explore the historic KwaZulu-Natal Battlefields, for example at Spioenkop, and learn more about the Anglo-Boer or Anglo-Zulu Wars.